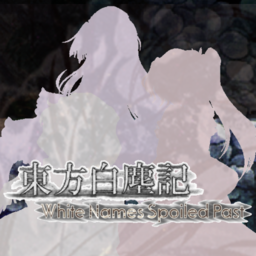 TouhouHakujinki (White Dust Record) ~ White Names Spoiled Past. (東方白塵記 ～ White Names Spoiled Past.) is a fan-made Touhou Project script for the Touhou Danmakufu ph3 shooting game engine, developed by several members and associates of the team behind previous fangames The Last Comer and Mystical Power Plant. The main portion of the game was released on September 13, 2014, and the Extra Stage was released on January 24, 2015. Both the main game and the Extra Stage can be downloaded for free at the official website. The game contains fan-made characters made by NRT as hypothetical versions of unknown figures from official games of the Touhou Project, such as Sasha Sashiromiya who's based on the unknown figure from Touhou Hisoutensoku. The game (and by extension, NRT) pokes fun at itself for featuring fan-made characters that quickly became forgotten. White Names features original music in the style of ZUN, composed by Misora (深蒼穹). Rather than going onto the website and clicking "東方白塵記 ～ White names spoiled past" for main scenario, go to this link: "http://www1.axfc.net/u/3319280". Enter the correct Captcha code in the text-box and click the button "[ 3319380.lzhをダウンロードします。]"
Click where it says "click here to start download." and, if you don't see a download window, click "こちら". Once downloaded, extract the file using a program that compatible with .lzh and start playing. For the extra stage, go to http://www1.axfc.net/u/3398498 and follow the same steps on 2–4. This page was last edited on 17 June 2018, at 20:44.